Distributor: Currently licensed by FUNimation, but also streaming on Crunchyroll. Notes: Based on manga by Hajime Isayama. "1,000 years in the future", in the year 845, the remnants of the human race, inside their triple-walled fortress city, have their outer wall breached by a particularly gigantic Titan. The onrush of Titans through the breach includes one that particularly arouses the hatred of Eren Jaeger, who swears his revenge, a quest that eventually leads him to join the forces defending the city. Eren Jaeger saved the life of Mikasa Ackerman when they first met, and Mikasa has been returning the favor- again, and again, and again. In fact, Mikasa is SO good at rescuing Eren from the scrapes his temper gets him into that he feels inadequate. Eren finally finds something he can do that Mikasa can't (as far as we know), but it proves a somewhat controversial talent, and it has some problems with reliability as well. To the extent that there's much interpersonal drama in the show at all, the second synopsis above is pretty much it. I'll have more to say about that shortly. I've had a number of thoughts about this show, and even more things came to mind on the second viewing I gave it for this review, done after Season Two, which naturally puts Season One in a different light. Some of the issues here are ones I've raised in the Comments part of the website. First I'd note that the basic concept of the show could probably have come to a lot of people in a nightmare, so the real opportunities for creativity would have to be in its characters, visuals, or plotting. But I have to agree with Nicoletta's conclusion, in her review, that "characterization is not the show's greatest strength." We've got hot-headed Eren, and super-competent Mikasa (who, other than in her obsession with keeping Eren safe, never shows much emotion at all.) There's also their friend from their hometown, Armin Arlert, who's hopelessly timid (albeit extremely intelligent)- and thus, it seemed to me, not exactly the sort who'd be a welcome recruit among a bunch of aspiring Titan-killers. Beyond this trio we have an array of Eren's fellow cadets, most of whom will have just brief scenes at best (even the ones that SURVIVE the Titan attacks!). Since we don't really get to know them at all well, it was hard for me to work up the sense of shock and outrage that the show clearly wanted me to feel when some of them turned out to be traitors. The second part of Season One did introduce a couple of new cast members that I found to be at least pretty interesting broad sketches of characters- in fact, they were the only characters in the show that kept my attention. I'll get to them a little later. Attack on Titan often draws its characters to match their personalities; in post-Season Two retrospect, at least the females who turned out to be traitors seem to have had a characteristic "look" about them, and that brings us to the show's artwork. And as for the plotting: I've complained about the fact that the cadets are remarkably ill-prepared for their first real encounter with the Titans. The show's melodrama, of which there is plenty (just not that much real interpersonal drama) oscillates between bravado and angst, with the absolute nadir, the most angsty moments in First Season, happening after that first encounter, when only Mikasa seems to keep her head and remain a fully-functional fighter (super-competent, as always.) It just doesn't make sense to leave your new troops so psychologically ill-equipped to do their job. Someone from the Survey Corps (who experience Titans on a regular basis) should have been in charge of that aspect of their training. 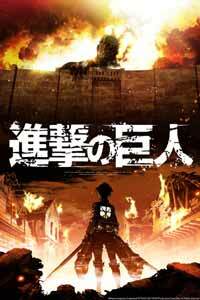 But to be fair, the second half of Season One, chronicling Eren's initial forays with the Survey Corps, and ESPECIALLY through the whole chase with the Female Titan, contained some spectacular action sequences. Even the buildup to the encounter with the Female Titan was well executed- we first see her at a distance, and do not at first recognize just what a menace THIS particular Titan would turn out to be. Armin's encounters with her are laden with a suspense that the show doesn't often manage- for TRUE suspense is based on fear of what MIGHT happen; mere carnage, which the show much more commonly delivers, is not the same thing. The second part of Season One also introduced Zoe Hange, the show's resident (somewhat) mad scientist, a woman who wants to capture Titans to study them, with the aim of discovering their weaknesses- and who has, perhaps understandably, a weirdly ambivalent attitude about her "guinea pigs". We also meet Captain Levi, who we're told was once a thug and who we see as a taciturn, cynical little guy with a sadistic streak- but also one with nerves of steel, and competence in combat rivaling Mikasa's; whether his agreement to sign on with Survey Corps Commander Erwin's plan was a particularly good decision I won't go into here. Both Hange and Levi show evidence of having more than one thing going on in their heads, which in THIS show makes their characters at least SEEM "deep" by comparison with everyone else. Recommended Audience: Not for children and not for the squeamish. People are eaten alive in gruesome detail; that, I think, is warning enough, but the Titans are also dismembered in gruesome ways, and bloodshed is rampant in most episodes.